News from LMCU: LM Auto Center has (a LOT) More to Offer! LM Auto Center has (a LOT) More to Offer! At Lake Michigan Auto Center, we're more than just an auto lot. We provide financing, insurance, vehicle service, and even a car wash-all at one convenient location. We pride ourselves on offering excellent deals on great vehicles with stellar customer service-all within a clean, no-hassle environment. Our 200+ vehicle inventory features an extensive selection of lease returns and previously-owned vehicles. These locally driven, late model lease returns are in great condition and offered at amazing prices. Whatever your taste, from sports cars to practical mini-vans, we have the vehicle for you. 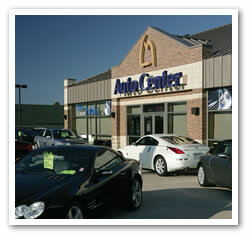 Browse our current inventory anytime day or night by visiting LMCU.org/AutoCenter. We're located in Hudsonville, south off the I-196 exit. Stop in, call us at (616) 643-0619 or visit LMCU.org/AutoCenter. *APR=Annual Percentage Rate. **Financing special valid only while inventory lasts, and only applicable on Volvo models. Rate subject to change without notice. †Off sticker price. Available discount applies to current LMCU members and is not applicable on Volvo models. Non-members are eligible if vehicle is financed through LMCU. See Auto Center for details.